Last week I showed you how to use an article’s reference list to locate other sources on a topic. This week I will show you citation searching. The two techiques both rely on references. In last week’s blog, I found an article in OneSearch and went to the reference section to identify other relevant articles to my topic. By getting a copy of these articles, and then following-up on their references, I keep getting more and more articles. However, this process is moving backwards in time and therefore the articles are progressively older than the original article. In contrast, citation searching moves forward in time. Google Scholar, which is a good database in general, is one of the few that offers citation searching. Let’s use the article example from the previous week. The articles listed under the original one are all newer articles (post 2003) that have the original article in their reference list. By having the original article in their reference lists, it is possible these articles will be relevant to your topic as well. In the example above, it is clear two of the articles are directly relevant. Also note, on the right hand side it says whether the article is available electronically to NMU students, faculty, and staff. To see the full text availability, though, you must be using the internet via NMU. If you are using Charter or some other private service, you will need to click on the Google Scholar link in this post, or the one in our A-Z database listing. At that point you will be prompted to enter your NMU ID and password and the full text links will show. 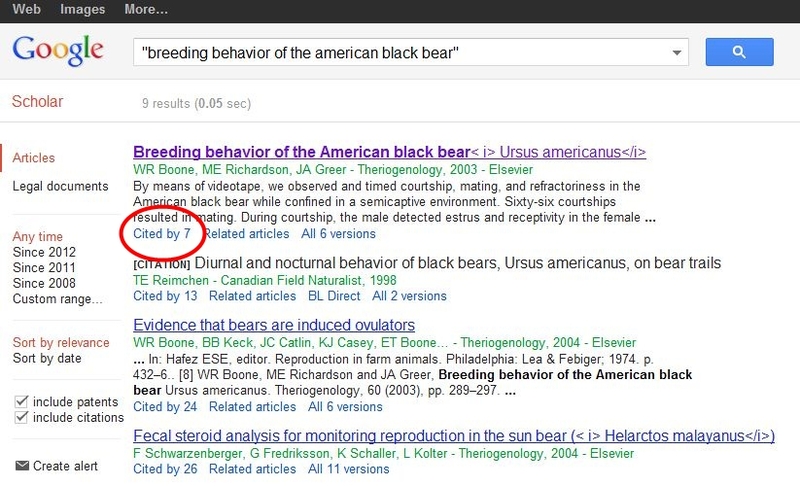 So in summary, using the combination of OneSearch, reference lists, and citation searching, you can quickly identify relevant sources for your topic.